As any builder or HGTV enthusiast will tell you, mold in buildings is a dangerous thing. Not only can growth bring on questionable smells and stains, but it can have serious health implications, too — especially for people with respiratory issues. At Metallic Products, our crew believes knowledge is power, especially in regard to metal building maintenance. Here are a few things to keep in mind when it comes to spotting and preventing mold in buildings — and keeping indoor environments safe. Unlike tell-tale fuzz on forgotten bread, mold inside a metal building isn’t always readily apparent. After all, it has plenty of places to hide. The first sign of trouble might be an earthy smell or stains around windows, doors, ventilation units and other areas prone to moisture. 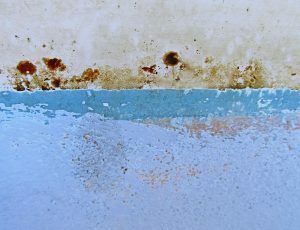 Condensation can be mold’s best friend, especially when paired with humid conditions. Does your metal building have a pipe that’s prone to leaks? Does rainwater tend to make its way through weak seams? Pay special attention to any areas that might have experienced heightened moisture levels in the past, as mold will swoop in if given the chance. The bad news is, mold loves the temperatures that we tend to find most comfortable. The good news is, it thrives on organic matter — and your metal building is inorganic. So, while growth will do damage if left unchecked, it won’t feed on the actual steel that comprises your structure. Carry out regular walk-throughs to scope out leaks or corrosion around your metal building — and be sure to check your vents, HVAC units and other building ventilation equipment. If you do spot out-of-place moisture, clean it up. Then, schedule repair work or take other measures to make sure it doesn’t return. Mold in buildings can be serious business, but rest assured it is also preventable. When you keep humidity at bay — and indoor air properly flowing — you encourage a safe and healthy atmosphere inside your metal building. Want to know more? The U.S. Environmental Protection Agency offers a ton of useful information about mold growth, testing, air quality and more. Stop by their website and stay informed!